According to Estadio Deportivo, a Barcelona player could be set for the Premier League as he has grown disillusioned with life at the Catalan outfit as he is not being used as much as he would desire. 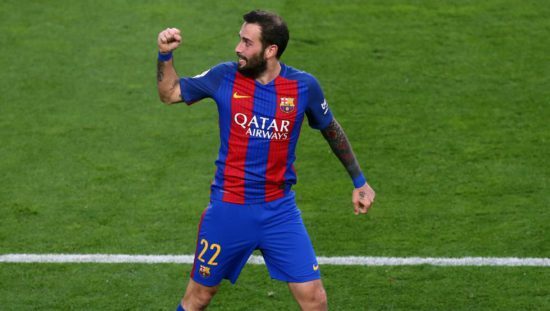 28-year-old Aleix Vidal is keen on moving to England and his agent has sounded out a number of clubs in the division, including Manchester United and Liverpool. The former Sevilla man has found himself third choice at the right back department behind Sergi Roberto and Nelson Semedo despite his versatility on the right hand side of the pitch. Despite scoring in the recent 3-0 victory over Real Madrid at the Santiago Bernabeu, he is still not playing regularly and is seen as a dispensable member of Ernesto Valverde’s first team. He was signed as the long-term replacement for Daniel Alves, but has never had a consistent run of ages to make that position his own, suffering a nasty injury in February 2017, that ended his season. It is also rumoured that the likes of Everton and Manchester City are also interested in taking him to their clubs this winter. He still harbours hope of playing for Spain at this summer’s World Cup and knows that first team football will be key to the actualisation of that dream. United need a right-sided player to offer cover for Antonio Valencia as Matteo Darmian is nowhere the quality expected of players that turn out for Manchester United. The Italy right back has is also expected to leave soon and Vidal will be a quality addition to our team as he can also play as a right singer. He is fast and is also a good defender that won’t have problems adapting to the intensity of the English game. Barcelona will most likely accept a reduced fee in a bid to raise funds after shelling out £142 million on former Liverpool star, Phillippe Coutinho.